Sometimes it seems like the gluten-free crowd misses out on all of the hot new food trends (I’m looking at you, cronut — one day you’ll be mine! [mwahahaha]), so it’s nice when one comes along that we can be a part of without pulling out all the stops and wrecking our budgets. Cue the naturally gluten-free, quick-to-prepare, terrifically inexpensive and, above all, TASTY avocado toast. 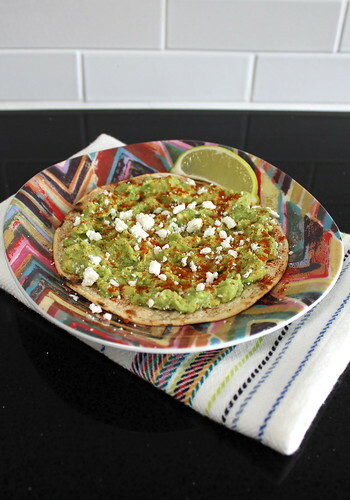 When I first started eating gluten-free, corn tortillas were my go-to sandwich bread substitute; so inexpensive, quick to heat up in my dorm’s microwave and surprisingly good to eat warm spread with peanut butter. Thankfully, there are way better sandwich bread options available nowadays — you really can’t go wrong with either the white or whole grain from Udi’s — but they are significantly pricier than the good ol’ corn tortilla, so we’ll use the budget-friendly option here. Avocados are luxurious enough, right? Lately, I’ve used the cheapest corn tortillas from Trader Joe’s to make my avocado toast; they’re much more full-flavored (corn-y? lime-y? can’t quite put my finger on it . . .) than those by Mission or Guerrero, but they work with all of the other flavors going on in the avocado toast (with peanut butter, not so much). It feels a bit silly providing a recipe, but here’s the gist: heat up tortilla, smoosh up avocado with a bit of lime juice, spread atop tortilla, sprinkle with cayenne (or your favorite ground chili pepper) and a touch of cheese (cotija, feta, cheddar, basically whatever you have lingering in your fridge or Kosher salt to keep things vegan) and savor your brilliant work! Warm tortillas in the oven (wrapped in tin foil, about 5 minutes in a 350°F oven), microwave (atop a paper towel, about 30 seconds) or very carefully as to avoid a kitchen fire, over a low gas flame (set tortilla directly on a clean burner [so it’ll be 1 – 2″ above the flame], flip occasionally until lightly browned in spots). Set warmed tortillas on a plate. Scoop avocado into a small mixing bowl, smoosh up with the tines of a fork or potato masher until as chunky or smooth as you like. Mix in lime juice to taste.